Vancouver — In a leaked memo to the board of directors of Lululemon, high ranking employees expressed concerned about an advertising campaign that was about to be launched by Chip Wilson just before he was ousted from the CEO position of the company. The memo cites that the CEO had been acting “erratic”, citing several employees who claimed that they saw Mr. Wilson sitting naked in a lotus position on piles $100 Canadian bills in middle of his office while chugging bottles of premium kombucha. Attached to the memo where several graphics that the former CEO had designed and was about to release in a new marketing campaign. 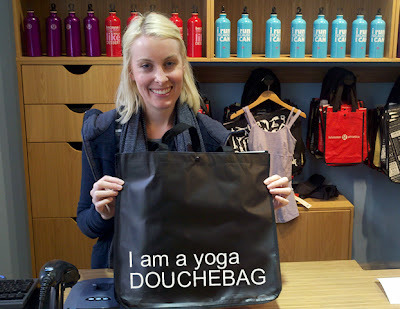 Besides two full color ads showing Lululemon buyers as being part of the “one percent” and another one showing Mr. Wilson proclaiming, “I laughed all the way to the bank”, the most curious was one showing a Lululemon bag with the slogan, “I am a yoga douchebag” emblazed on it. 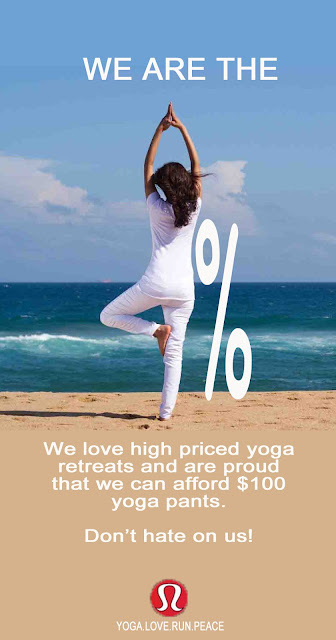 The memo concluded that, “Even though this is a damn clever campaign, we can’t risk alienating any more yoga bloggers”, in apparent reference to the firestorm that erupted last year after Lululemon branded the slogan, “Who is John Galt”, on its bags. Note: As of March 2011, Wilson's estimated net worth was $1.9 billion with organization revenues of $700 million. Wilson is linked to the big-ticket Point Grey mansion--worth $37.2--million--currently the most valuable home in Vancouver. In an interview with the former CEO for this story, Mr. Wilson said his only regret as head of Lululemon was not being able to launch this campaign because he really wanted to let his customers and the public know what he really thought about them.